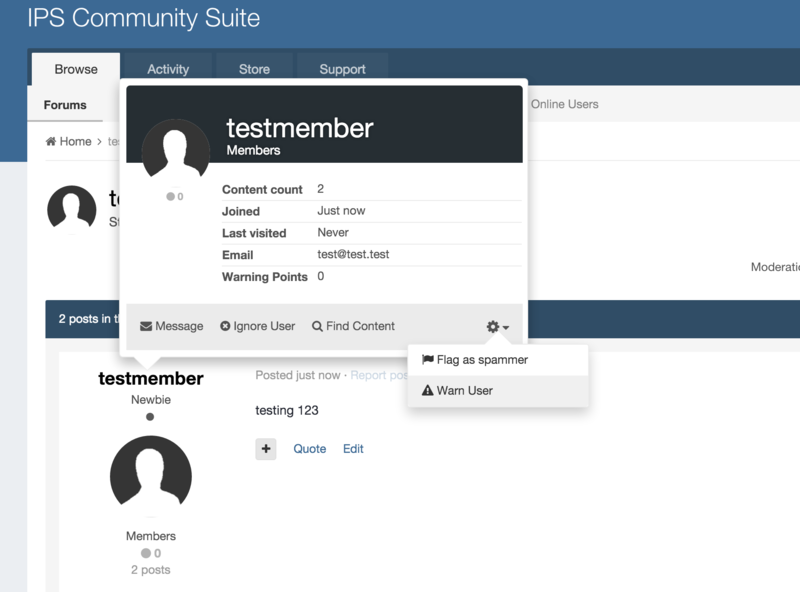 The warning system allows you a system in which to warn your members of unwanted actions on your site, and act upon those warnings automatically via the system, or by moderator action. 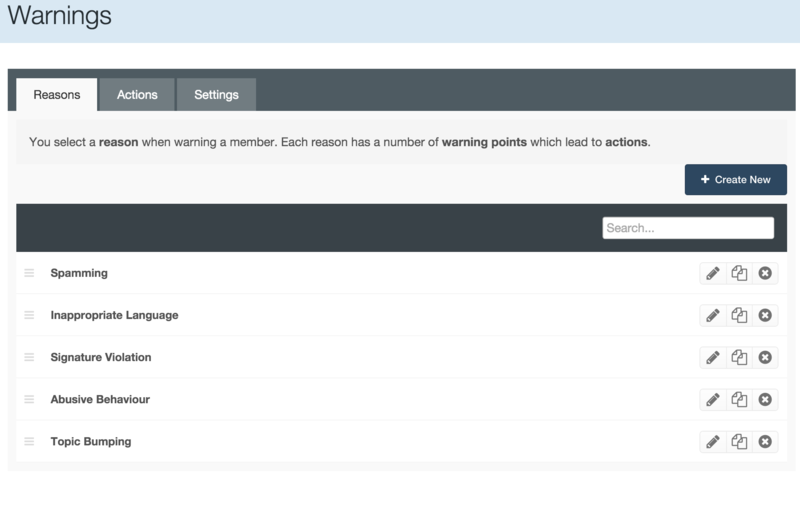 Setting up warning system on your site has 3 sections. Reasons, actions, and settings. Each of these will be discussed below. 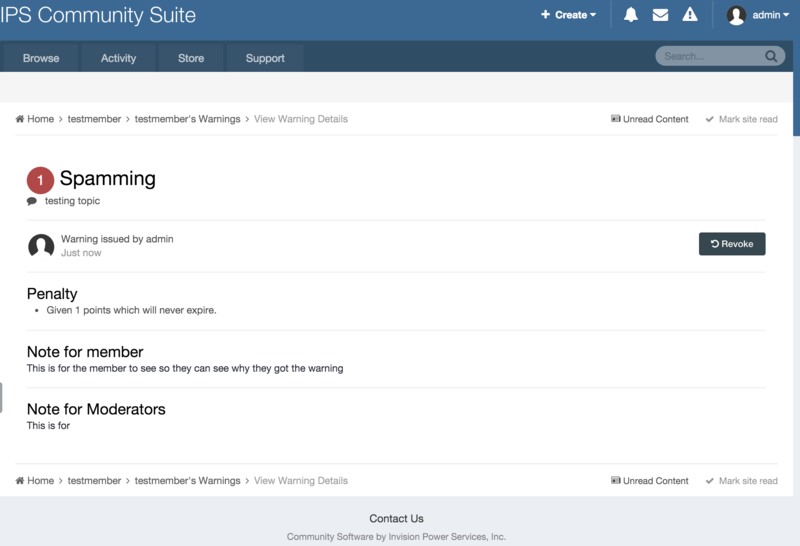 This section can be access from Members>Member Settings>Warnings within your admin area. When you first enter the area above, the first tab you will see are reasons. 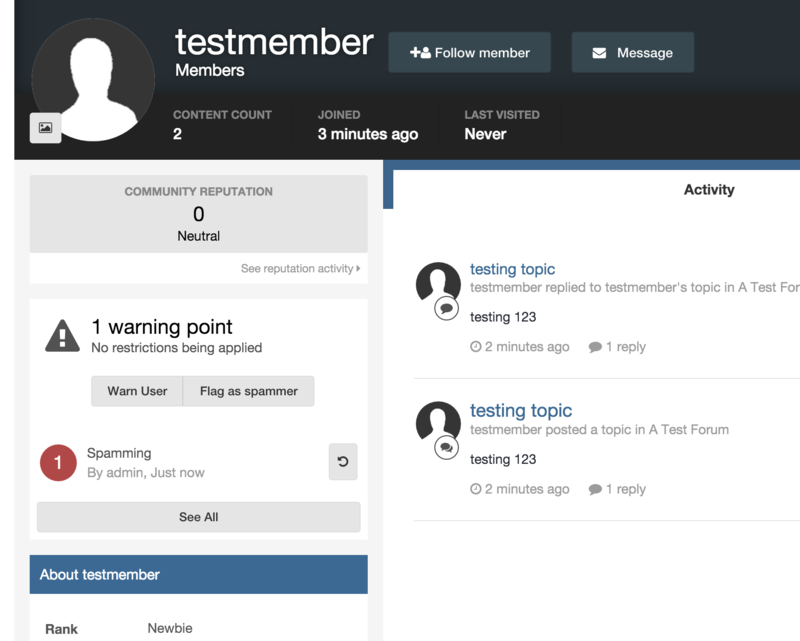 In here you will see a list of all the reasons for warning a member which are currently set up. This will look similar to the below. 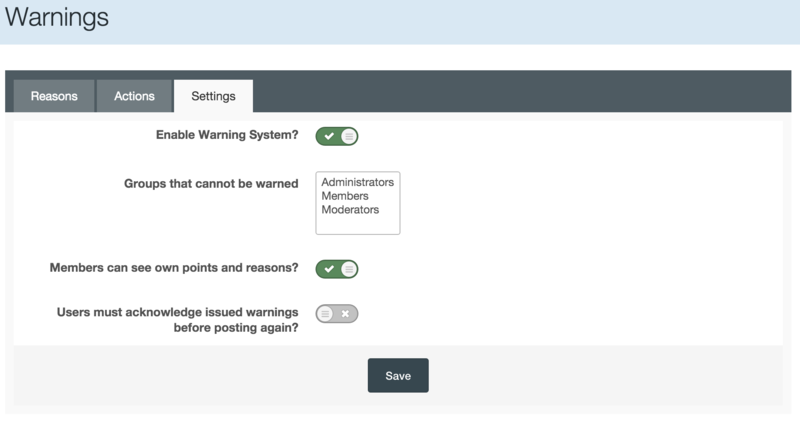 You can add to these reasons by selecting the create new button in the top right, or edit existing reasons by using the pencil icon at the side of any existing reason that is set up the name, number of points, expiry and other options related to warning actions. 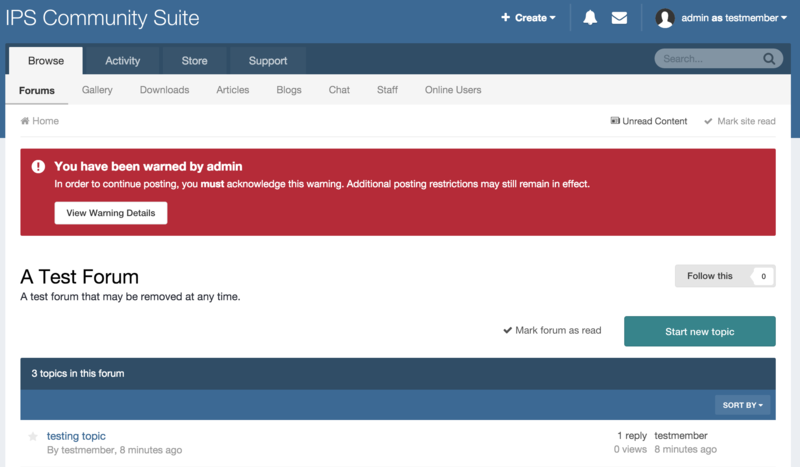 Actions compliment the warning reasons, by allowing you to process an action such as restricting a user from posting after a set amount of points. You can see the list of actions from within the actions tab. By editing or adding new actions, you can set up what happens to the users on x points. So in the example below, I have chosen to moderate the users content for 1 day upon reaching 10 warning points. As you can see below, you can easily restrict posting and ban using the warning system should you wish to do so. In addition you can choose whether or not the moderator giving these warnings can override the automatic action. The settings tab will allow you to enable/disable the warning system completely, along with set up who cannot be warned and various other items. The "User must acknowledge" setting will be discussed in further detail below. You can warn an area from both their profile. either in the mini-profile or in the full profile on the left. 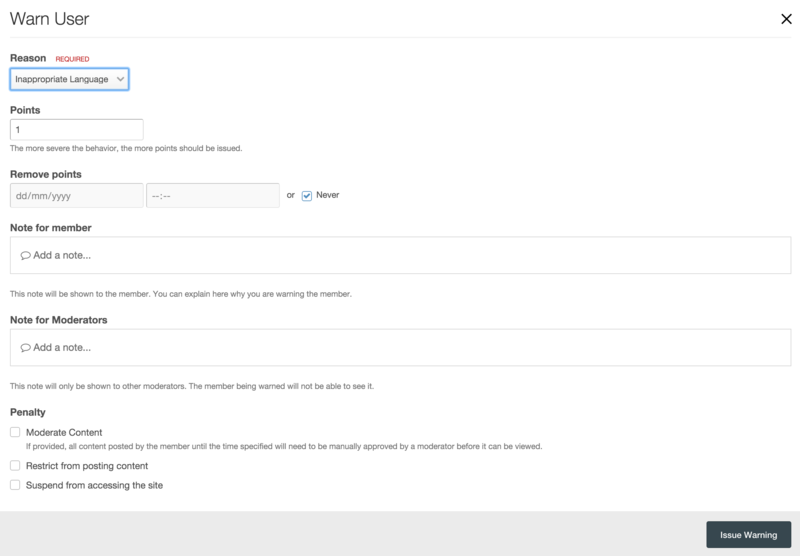 When clicking to add a warning to a member, you will be presented with a popup dialog which will allow you to choose one of the set reasons, or set your own if permissions allow. 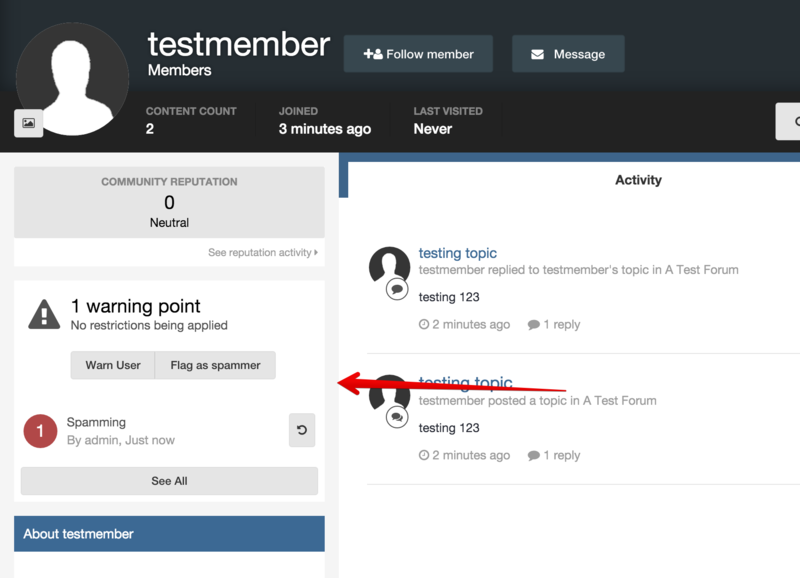 You can leave notes for both your members, and indeed other moderators. These will only be viewable to the relevant people, so moderators can see these in the warnings and a member will be shown the detail added the 'Note for Member' section only. Once you have given a warning you will be shown the details of the warning in which you have given the member. From here (as well as by selecting the warning in their profile) you can also revoke the warning should the need arise. 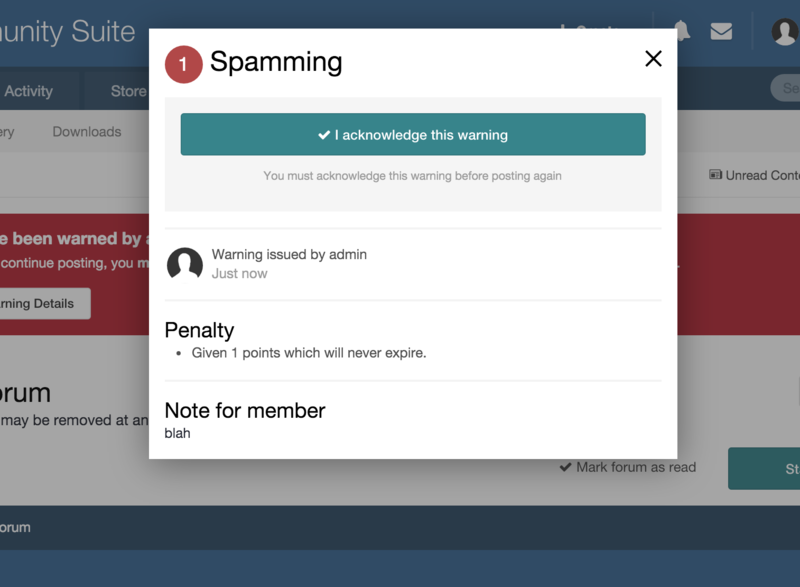 If a member has been given a warning, and your settings are set so that the member has to acknowledge that warning before they continue, they will be presented with a red bar at the top of the site, which will allow them to click and accept the warning in question. While within a members account in the ACP, you will see a section for 'Warnings & Restrictions'. Here you will see any items which have already been applied to the account, along with the warning level, and more options that can be used such as flagging as spam, or banning the user. Selecting edit in the top right of this section, will allow you to add and remove items of restriction from the users account. There are various items you can apply from restricting posting, to the restriction on adding statuses. A last resort to situations on your site, be it through spam, member misbehaviour etc, would be to ban offending accounts, IP addresses, or emails from your site. You can ban a member using the ban button within the restrictions section of a member account (See above section on restrictions. On using the ban button, you will be given the option to also ban the IP address if you wish, move the member to another group, and set the length of time to ban the account for. In this section, you can restrict access to your site from IP addresses, as well as restricting the email addresses and names that can be used on your site. This can be helpful if for example you wished to block registration by temporary email hosts, or stop people using the words 'mod' in their username. To add to this, simply use the 'Add Ban Filter' button in the top right. You will note from the above screenshot that there are wildcard(*) characters that have been used in some places. Where there are used, they will be match anything in that location. So for example, in the above you have *admin* . So if someone tried to register with I_am_admin_user then it would not be allowed when registering, as we are disallowing admin with anything prefixing or suffixing this.